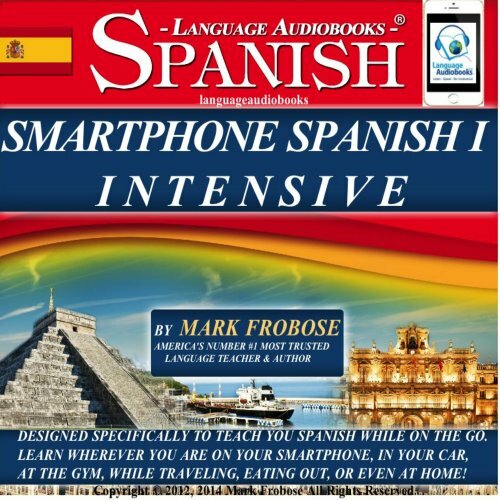 Smartphone Spanish 1 Intensive is the most effective and versatile Spanish audio program in the industry. It can be used anywhere for any duration of time to teach to you speak authentic Spanish while in your car, at home or on your smartphone! Learn Spanish fast wherever you go! Designed specifically for use while on the go, this challenging, versatile and fast-paced program introduces, reviews and challenges you to interact successfully in spoken Spanish from any location during your otherwise wasted down time. A variety of educated native Spanish speakers from Mexico and South America teach you how to speak and understand authentic Spanish, while a degreed and certified American Spanish instructor explains how to put all the pieces together. What made the experience of listening to Smartphone Spanish 1 Intensive the most enjoyable? Challenging enough to keep my attention but not too difficult to keep up with. I wish that I would have had this amazingly portable audio program when I was taking high school Spanish. I did pretty well in class, but all those good grades didn’t result in my being able to communicate very well in Spanish. If I could have learned to actually speak Spanish while I was waiting for red lights and orthodontist appointments I would have been flying high. Smartphone Spanish 1 Intensive has a pretty informal style but it is obviously not thrown together haphazardly. Those who have never studied Spanish can follow along pretty easily but it is not too much for those at a more intermediate level, especially people like me who did pretty well in classroom Spanish but never learned to speak it. There is a brief but helpful explanation, a good reminder for me, about the difference between the Spanish verbs ‘ser’ and ‘estar’, both of which mean ‘to be’ in English. It uses a variety of speakers who obviously speak Spanish as a native language. Textbooks are great for what they are, but you can't drive and read. Smartphone Spanish is obviously designed for learning on the go. A few audio lessons won’t make you totally fluent, but I believe that just using Smartphone Spanish regularly during your waiting and commuting time should have you speaking Spanish conversationally faster than you or anyone else could ever expect. I can hear my own progress every time I listen to the program. Wanted to learn to speak Spanish since I was a kid, but never got the time or had the money. With Smartphone Spanish, I learned to speak a lot of practical basics while waiting at red lights, at doctors & dentists wating rooms, and so on. It presents a somewhat challenging and spontaneous way to learn authentic Spanish. Quite unconventional in its approach, I found it to be really effective in teaching me to speak and understand Spanish with my Latino coworkers. Excellent narration and different Spanish speakers helped me. While not perfect, this is a great program for all who wish to learn to speak a lot of Spanish fast without the pain and expense. Excellent and worth the paltry sum it costs.